Please Note: this is a breaking change. Fixed a bug that could cause problems while saving files as images. Fixed a bug that could cause a licensed version to act as demo version. Fixed a bug that caused an "Unexpected file format" error message to appear while trying to re-open a saved file. 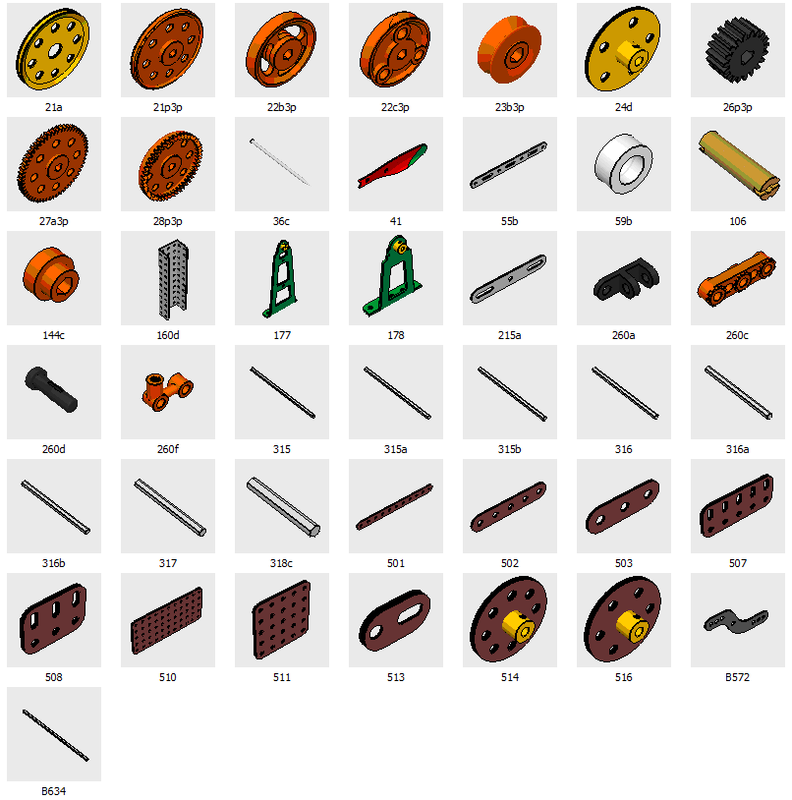 Added a way to identify parts that are "hooked" to selected items. Added parts No. 545, 109a-2, 109b, 51f, 51g, 64a, M5, 213a, 213b, 27ao. Fixed a bug that could result in an incorrect motion propagation on some engagements. Fixed some compatibility issues with Windows Vista. Part No. 212 has been redesigned. Now it supports bending. Fixed a bug that did not permit a correct engagement between a translating part and a translating or rotating part. Now after selecting a Unit, the user can move it by using + and - keys with no need to click on an arrow. Fixed an issue regarding part No. 136 and part No. 179. Fixed an issue related to System Key generation. Registered users who have installed release 1.5 and got a different System Key should download and install release 1.5.1. Fixed a bug when defining a Unit, caused by clicking on Set as Stop button when no parts were selected. Gear No. 27 now correctly features 50 teeth. Double-clicking on a rod or a bolt not inserted in any hole makes all the movement arrows appear, enabling all possible movements. Fixed a bug related to unit deletion that could crash the application under specific circumstances. Context menu for part No. 21 now correctly reports "Add part No. 142d". Fixed a bug that could cause unexpected behaviour after undoing a cut and paste operation. 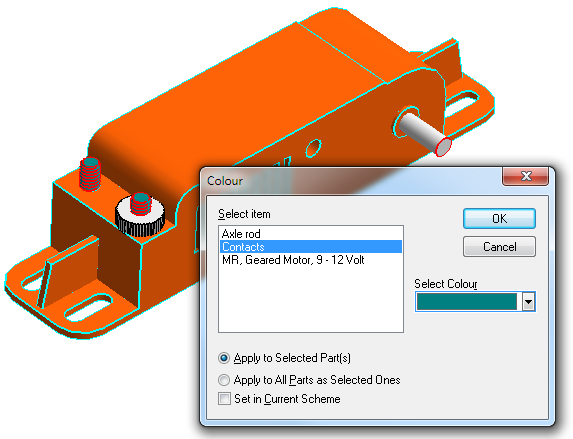 Fixed an erroneous indication of a weight 0 when a few specific parts were used in a model. Fixed an erroneous behaviour during unit definition, where some unit attributes were not saved if switching to a different unit. Each newly created unit now has only the two bigger arrows enabled by default. Fixed a bug that crashed the application if a window were closed while the Unit dialog box was open. Added keyboard shortcuts for some common operations. Bolts are now always inserted with their heads facing the user. Added support for automatically adding a ball (part No. 168d) on each side of a socket coupling (part No. 171). Now you can invert a part even if it is constrained by other parts. 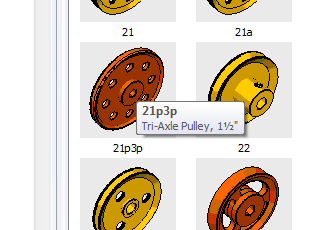 Now you can translate a part along an axle with the option to bypass any constraint (press Shift during translation). In order to avoid unintended movements, a warning is issued whenever a user action may result in the repositioning of a big part of a model. Solved an issue related to Units involving composite parts (e.g. motors). Introduced a way to simulate meshing among gears and other parts. Please read the chapter Engagements in the online Help. Fixed a bug related to flat plates' bending. Now crank handles have correct lengths. A few corrections have been applied to measurements of parts No. 51a, 51b and 51c. Added some new parts, see part list. Added support for area selection using the right mouse button. Added new parts, see part list. Added support for hiding arrows when movements are performed using the keyboard or remote control. 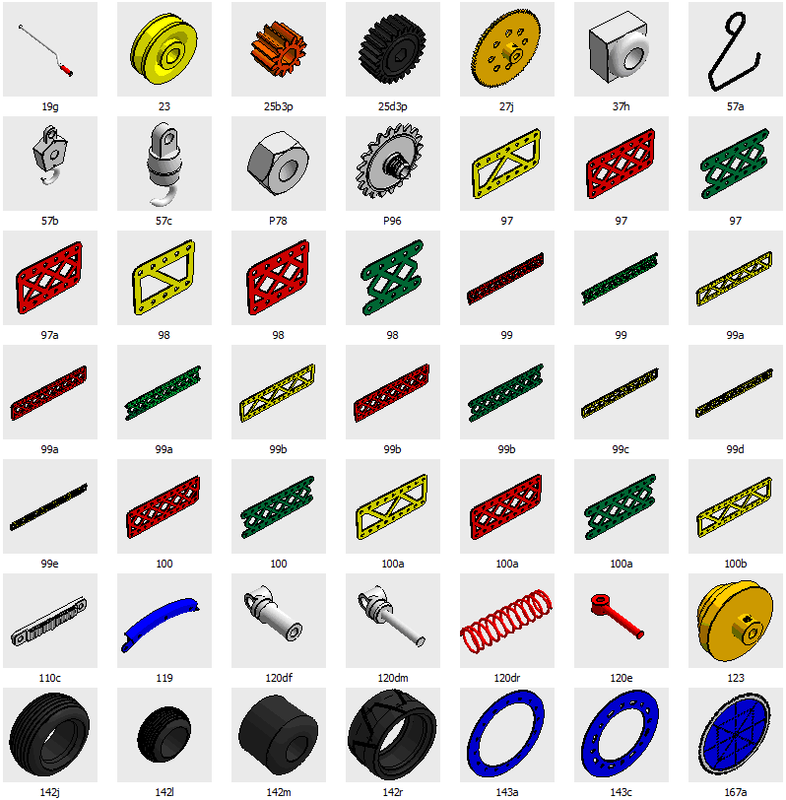 Corrected thumbnails for parts 235g and 235h. Fixed an erroneous behaviour related to part No. 20c and its corresponding tyre No. 142a. Merging models is now much more user friendly. Fixed an issue related to arrow movements on systems with low colour quality set. 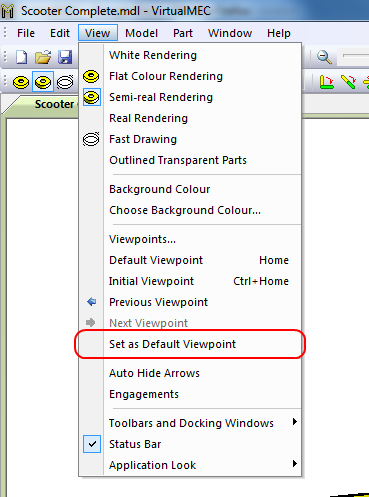 Dragging with the right button pressed selects the enclosed parts then opens the context menu. 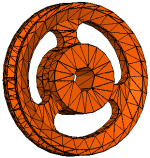 When no parts are selected, the model now rotates around its geometric centre, thus avoiding the need to re-centre it in order to obtain a satisfactory behaviour. Now users can freely delete any parts regardless of where they are placed in the model. Added cut, copy and paste features. Now every VirtualMEC versions (included the Demo one) act as enhanced viewers (VirtualMEC Viewer is not needed anymore). Speed of Player has been noticeable increased while in "Play forward" mode. Hole placement of part No. 518 has been corrected. Icon for part 26n now is correct. Added the ability to copy the entire graphics window content to the Clipboard. Rendering of part No. 140z has been improved. Rendering of part No. 185 has been improved. 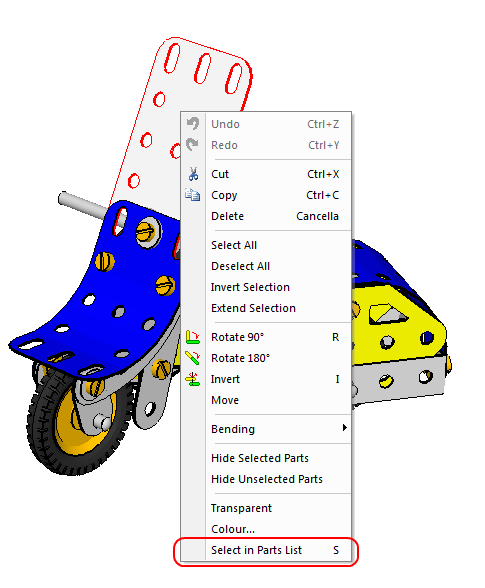 Double-clicking on a part now automatically deselects any other selected parts. That fixes a sometimes misleading behaviour of previous releases. Fixed a rendering issue regarding part No. 216 that could cause a crash on some machines. Fixed an issue that sometimes caused a bolt to be inserted rather than the intended part. Added handling of context menus (right button menus). Now users can choose a background colour to be applied in all rendering modes. Added Default Viewpoint and Initial Viewpoint menus. Added Part Move menu to show movement arrows. Arrows can now be moved using + and - keys. Added File Steps menu and dialog box. Fixed some issues relating to bending. Now there's no more need to unhook parts or define units in those situations where more than one hinge is involved. Added new parts (long bolts, pivot bolts, etc. ), see part list. Fixed a bug that caused a crash when some specific parts constituting a Unit were deleted. Fixed an issue regarding image saving. Added part No. 700 Electric Motor. Added a menu item to enable/disable background colour in Real Rendering mode. Added menu item View Outlined Transparent Parts. Any part can now be made transparent and rendered as outlined while other parts are fully rendered. Added menu item Edit Invert Selection. Fast drawing mode is now permanent until you disable it. It does not automatically convert to full rendering at the end of a rotating/panning operation. Added support to add comments and other information to a model file (menu File Properties). Now, new and loaded models are rendered according to the last rendering mode used. Fixed a rendering issue in part No. 168c. Fixed a rendering issue in part No. 37a. Fixed a rendering issue in part No. 162a. Part No. 216 now correctly has only three holes in each row. 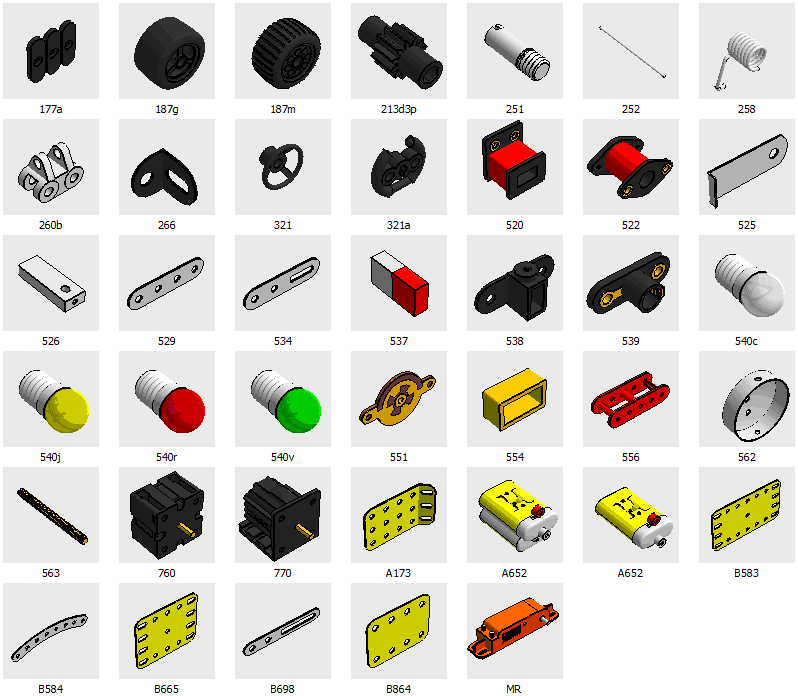 Added more than 300 new parts, see part list. Added support for saving files as images in the following graphics formats: bitmap, jpeg, gif, png and tiff. Added support for merging models. Fixed a rendering problem in part No. 187e. Added support for defining custom Sets (see help topic Sets). Fixed a rendering issue regarding Trunnion border. Fixed a rendering issue in part No. 128. 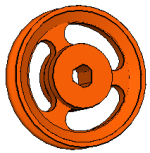 Added support for Allen Bolt (37bh) and Hexagonal Nut (37c). Fixed some rendering issues regarding Flanged Plates' borders. Now holes have a much more "rounded" profile. 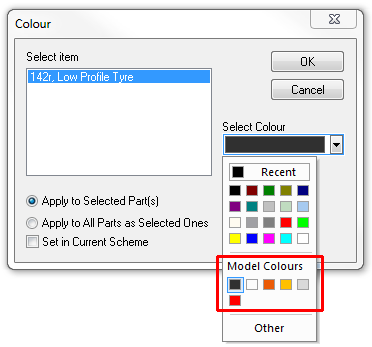 Improved handling of part colours and colour schemes (see help topic Colours). Adding of bolts and rods is more consistent with adding of other parts. No need of right-clicking (see help topic Adding Parts). Patched a Visual Studio bug that inhibits an already executing VirtualMEC instance to open a file when the user double-clicks on a model icon. Fixed a bug that caused a crash when in the Unit dialog a pivot was set without prior setting a master. 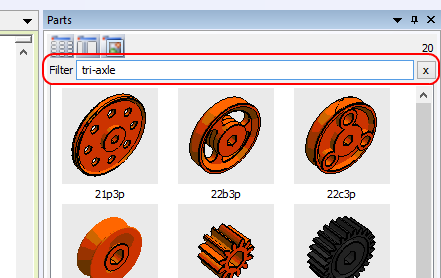 The docked Parts Bar width has been increased to show two columns of parts even when displayed in low-resolution. Added support for purchasing limited versions of VirtualMEC.